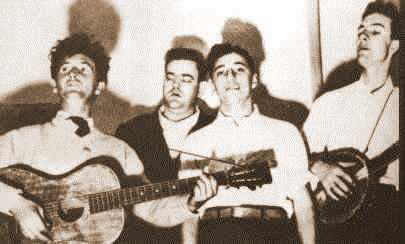 The Almanac Singers were a folk outfit from New York City. Their lineup featured Millard Lampell, Lee Hays, Pete Seeger, and Woody Guthrie. 'Jim Garland was here in Leadbelly's house, and Jim's wife and their three children. Jim's children were sick lots of the time, and his wife took down with the fogs of TB. Then Jim got down with it, and for a long time he walked and fought it, and he would come to Leadbelly's house for the same reason why I had come, to find your strength to fight the thing that holds you back. He carried his wife, I forget her name right now, but he walked her here because the walk and the sun was good, because their apartment house was sunless, sickening, stinking, and old, run down, chipping away into the winds, and decaying like a marsh full of dead logs.